Wash and soak the yellow lentil/Moong daal for 3-4 hours. Drain the water from the soaked daal and wash it once with fresh water . Add the soaked daal, ginger and 3 chopped green chilies in the mixer jar. Now add the coarsely ground lentil paste in a bowl and add salt,asafoetida, pounded coriander seeds, crushed peppercorns ,cumin seeds, red chili powder and mix it well. Slice the remaining 4 green chilies lengthwise and add in the lentil paste along with the chopped coriander and mix. Now heat enough oil in a wide and deep pan. Dip the potato slices in the lentil paste and gently drop in the medium hot oil. Deep fry on medium flame till the fritters become golden and crisp. Don't overcrowd the pan, fry pakodas in batches till all the batter got finished. Drain the fried pakodas on a paper napkin to absorb the extra oil. 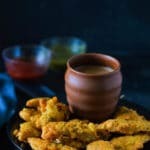 Serve hot with green chutney,ketchup and a hot cup of tea.